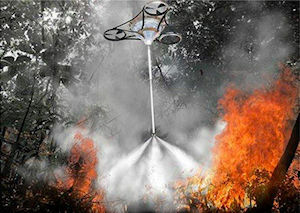 In 2013, I proposed using drones to extinguish future forest fires. Admittedly, both the idea and the technology were crude, and proposing an idea like this is not the same as implementing a solution. During the first few minutes, between the time when a fire first starts and when it reaches a point of being out of control, is a containment window where only a few gallons of water or a few pounds of fire retardant is necessary to put the evil genie back into its bottle. Using a fleet of surveillance drones, equipped with special infrared cameras, fires can be spotted during the earliest moments of a containment window, signaling a fleet of extinguisher drones to douse the blaze before anything serious happens. 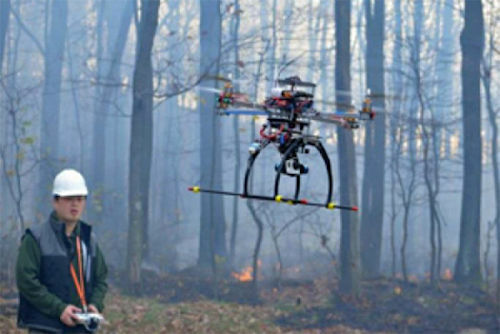 Drones specifically designed for extinguishing forest fires have the potential to eliminate virtually 100% of the devastating fires that dominate newspaper headlines every summer. But is that what we want? Also in 2013, University of California Berkeley astrophysicist Carlton Pennypacker, along with a team of researchers, proposed the development of the Fire Urgency Estimator in Geosynchronous Orbit (FUEGO). FUEGO, as he imagined it, would harnesses drone and satellite technology to spot wildfires in their early stages, long before they were out of control. As he imagined it, the advancing convergence of sensors, drones, image recognition, and AI technologies would soon turn this approach into an obvious solution to the increasingly destructive wildfires. Fire seasons are growing longer in the United States and around the world. There are more than 8,000 forest fires each year in Canada. Cost of fighting U.S. wildfires topped $2 billion in 2017. According to the U.S. Forest Service, the changing climate has extended the wildfire season by an average of 78 days per year since the 1970s. For this reason, agencies find it necessary to keep seasonal employees on their payrolls longer and have contractors standing by earlier and available to work later in the year. All of this adds to the overall cost of fighting fires. In recent decades, housing developments have pushed into areas with fire-prone ecosystems, where humans and nature collide. Because of political pressures, the Forest Service has shifted its priorities from protecting timber resources to trying to prevent fires from reaching houses and other physical infrastructure. Are drones good news or bad news? In March 2018, a drone reportedly caught fire after it crashed, igniting dry grasses in an area called Kendrick Park, near Flagstaff, Arizona. The owner of the drone has been charged with starting a fire that destroyed 300 acres of grassland in Arizona’s Coconino national forest, a charge that could result in significant fines and jail time. Even though there are tons of experiments being conducted with fire-fighting drones, they are far from the perfect solution. Their inability to communicate with ground crews and other aircraft mean they can interfere with other air traffic, such as air tankers, helicopters, and additional firefighting aircraft that are necessary to suppress wildland fires. Aerial firefighting missions including aerial supervision, air tanker retardant drops, helicopter water drops, and smokejumpers all operate within 0-200 feet altitude, which is the same altitude that many hobbyist drones fly. Certainly not all fires are bad. For years we have debated whether to let nature take its course or have us intervene. In 2012 the U.S. Forest Service, which manages over 35 million acres of forests, made a major policy shift, deciding to intervene on all fires, something environmentalists contend will cause significant long-term damage. So if we have the capability of spotting fires early and putting them out, is that preferable to letting them burn? Do we need to rewrite policies regarding when and where fires should burn vs. having us intervene? As we add entire new toolsets to our fire suppression arsenal, these decisions become far more difficult. Who gets to decide, and how liable are they for making a bad decision? Even though they’re not universally accepted, drones are already making an impact on forest fires. With drones ranging from tiny quadcopters to big fixed-wing aircraft, they’re showing they can detect, contain and even extinguish fires faster and with greater safety. Drones give firefighters a bird’s-eye view of the terrain and even help them determine where a fire will move next, so they can make swift decisions about where fire crews should go and which residents need to be evacuated. Piloting an aircraft over a raging fire puts both pilots and crew at risk. Plane and helicopter crashes accounted for 24% of deaths attributed to firefighting between 2006 and 2016, according to the U.S. Forest Service. Drones that are equipped with infrared cameras can peer through smoke, while using sensors for wind direction and other weather variables to better anticipate how wildfires will spread. Tiny drones can whip through canyons and other confined spaces whereas helicopters often can’t fly low enough to capture the necessary high-resolution footage. However, managing a 24/7-drone fleet over our massively huge forestlands will be no small undertaking. Surveillance drones will likely be a separate operation from the fire-suppression drones. Extinguishing a fire under several layers of tree canopy will also be a challenge. Every kind of tree will likely require a different navigation strategy, and some densely covered grounds may be entirely unreachable until it’s too late. Operating future drones day and night through inclement conditions like wind, hail, and rain will require an enormous effort. But so does a full-frontal attack on a fire by smokejumpers, bucket-bearing helicopters, and slow lumbering slurry bombers that each dumped more than 2,000 gallons of red chemical fire retardant on a formerly pristine mountainside. New technology rarely fixes everything and it’s easy to see some of the downside here. But as with most things in the future, doing nothing is also not an option.